The immediate response to that was concern that Trump was emulating Richard Nixon and secretly recording conversations in the Oval Office. That, of course, would be a flagrant breach of privacy and protocol. It would make people reluctant to speak candidly when visiting the White House. And it would open the door to numerous legal vulnerabilities for both Trump and his guests. Ever since that tweet, the nation has pressed Trump to reveal whether or not he was making such recordings. His response was always a smug dodge and eventual refusal to supply an honest answer. That resulted in an ongoing suspicion as to whether he could be trusted in otherwise private conversations. In addition, the tweet was a blatant threat aimed at former FBI Director James Comey. Trump intended to throw him off balance with the suggestion that the covert taping might contradict his congressional testimony. It didn’t work. Comey’s cheeky reply was “Lordy, I hope there are tapes.” If nothing else, the tweet represented an unambiguous attempt at witness intimidation. Unfortunately, those tweets don’t end the controversy. The first question that has to e asked is: If he has “no idea” whether there are any tapes, then why didn’t he just say that weeks ago? He seems to think that being president is like being a contestant on a reality TV show. He obviously doesn’t believe he has any obligation to be truthful with the public he purportedly serves. Secondly, with the confession that he didn’t make any recordings, he is affirming that his original comment was in fact witness intimidation. The only purpose of suggesting the existence of such tapes would be to influence Comey’s testimony. It is the behavior of a bully who thinks he can get his way with offhand threats. Finally, it would be naive to accept Trump’s latest version of events as the gospel truth. His past is littered with so many shameless lies (see the Trump Bullshitopedia) that anyone assuming he’s telling the truth now is too mentally unstable to live outside an institution. It is entirely plausible that he does have tapes, but that they affirm Comey’s testimony and incriminate Trump. Under such circumstances it would behoove him to deny the tapes exist and try to destroy them. In any case, Trump’s sudden and dubious confession doesn’t really clear the air. There is still confusion that is entirely the result of his own irresponsible deception and self-serving manipulation. It may still come to pass that recordings are discovered and made public. His own tweet implies that others might have made recordings without his knowledge. That in itself would be evidence of gross negligence for a president. But there is one thing in that regard that is in his favor. Everyone would readily believe that he could be both gross and negligent. Congratulations, Donnie. The signs of desperation by Fox News in general, and Sean Hannity in particular, are becoming ever more apparent. 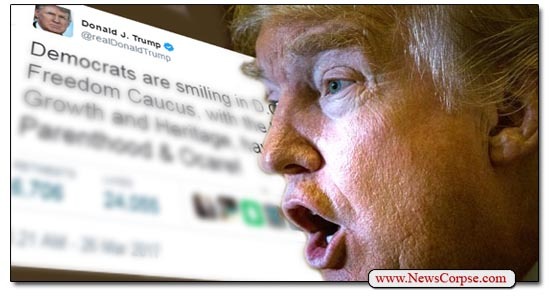 Their increasingly deranged creation, Donald Trump, ventures farther from reality every day. The bizarre antics on Fox News are reaching epic levels. Perhaps they feel unfettered since having abandoned their “fair and balanced” tagline. Not that it was ever taken seriously to begin with. 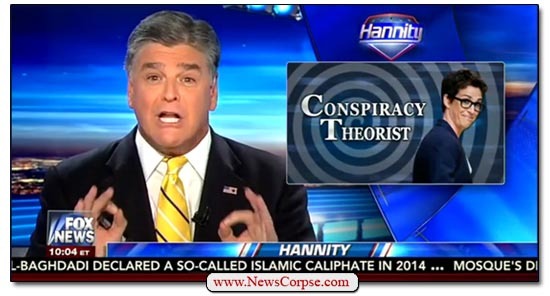 And with that, Hannity launches into a fiery diatribe on what he regards as a major conspiracy theory expose. Would it be on par with the Obama birtherism which he promoted for many years? Or the tragic death of Seth Rich, which Hannity attributes to a cabal of murderous Hillary Clinton associates? Well, hold on to your hats folks. Sean Hannity thinks that Rachel Maddow is behind a dastardly campaign asserting that Jon Ossoff’s election was foiled by the weather. He declares with astonishment that “You can’t make this stuff up.” Which is ironic, because that’s exactly what he’s doing. The basis for Hannity’s charges of conspiracy theorism is that Maddow asked her colleague, Steve Kornacki, if rain on election day might have depressed turnout in certain areas. Of course, it’s simply reality that inclement weather can have an impact on any election. So without drawing any conclusions, Maddow asked Kornacki if he thought it might have had any impact Tuesday night. She never blamed the weather for the final results or even expressed an opinion on it. She only asked a question. But in Hannity’s cartoon brain she was raving wildly that Mother Nature had purposely sabotaged the Georgia Democrat. There is so much wrong with that it’s hard to know where to begin. Let’s start with the absurdity that nobody is talking about, or believes, that Trump & Co. have unsavory connections to Russia. Rather than being a debunked, fabricated, farce, it is a fact that has been grudgingly admitted by the very people involved. They include Michael Flynn, Paul Manafort, Jared Kushner, and Jeff Sessions to name a few. In many cases their relationships were hidden and denied until discovered by the press. What’s more, Seventeen independent intelligence agencies agree that Russia engaged in deliberate actions to interfere with the election. Apparently Hannity thinks they are all lying as part of this massive conspiracy. As for his charge that Maddow is “whipping up” a new conspiracy regarding Trump and mob money, he’s giving her too much credit. It was veteran reporter and executive editor Tim O’Brien who broke this story for Bloomberg News. He wrote a detailed and documented article on “Trump, Russia and a Shadowy Business Partnership.” All Maddow did was cover the subject and interview the author. Hannity never mentioned that or even bothered to cite any actual flaws in the story. Hannity’s obsession with Maddow ignores the fact that she generally relies on established news sources. He demonstrates this by running a video montage of what he calls “Maddow’s craziest Trump/Russia conspiracy theories.” However, every one of the stories originated from other sources like Reuters or even government agencies like the FBI. And that’s the strategy behind Hannity’s baseless attacks. Even though Maddow gets her information from well researched and vetted journalists, her coverage of it makes it all her invention. Of course, the real problem Hannity has with Maddow is unrelated to his ludicrous charges. He has a two-fold inspiration for attacking her. First, she effectively covers Donald Trump’s tsunami of scandals. She explains the often complex issues clearly and backs up her explanations with facts. Secondly, Hannity is scared to death because Maddow has overtaken Fox News in the television ratings. Her show is frequently the number one program on cable news. Hannity isn’t used to getting beaten in the ratings, but it is now fairly routine. Consequently, he is coming out swinging, and swinging wildly, against a superior competitor. And the fact that he isn’t landing any blows must be making him all the more enraged and obsessed. Expect that pattern to continue playing out because Hannity doesn’t have the intelligence or the facts to support his positions. All he has is a drooling frenzy and a shrinking audience of Fox News cultists and Trump loyalists. That, in the end, isn’t going to get him very far, and he knows it.